Discovering ancient tombs filled with treasure is the goal in Wild Scarabs, an Egyptian-themed video slot from Microgaming. Played using a 5 reel, 243 ways to win game engine, this trip to the land of the Pharaohs comes with some pretty wild extras. A losing spin could turn into a winner thanks to the Wild Deal and Stashed Wilds can blast onto the reels during the free spins round. Play this low variance game on all devices from between 20p and £60 per spin. Microgaming has created a lovely looking game here. The reels are set against a backdrop of pyramids, palm trees and clear blue Arabian skies. The reels are set within marble pillars and include 6 lower value gemstones and 4 higher value hieroglyphs. You’ll see the eye of Ra, an Ankh cross, the jackal god Anubis and the bird god Horus. They’re joined by the scarab beetle which is the wild and a scatter. Winning combinations are made by landing matching symbols on adjacent reels. 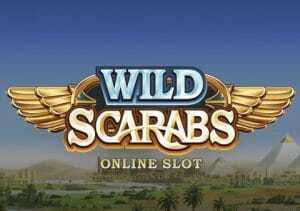 As you’d expect given its name, wilds are central to the feature action on offer in Wild Scarabs. Wild Deal feature – this can become live if you land a wild on the middle reel but you don’t strike it lucky and land a winner. Up to 4 extra wilds are added to the reels. You’re guaranteed to land a winner with these extra wilds in position. Free Spins feature – 10 free spins are awarded if you manage to land 3 or more scatters on the same spin. Helping your winning chances here is the Stashed Wilds feature – every time a wild lands that doesn’t form part of a winning line, it is added to a meter. Once you’ve collected 3 wilds, they are dropped back into play to create a guaranteed winner. Wild Scarabs is a pretty basic game, albeit one that comes with some very shiny design. Both of the wild extras offer some decent potential. This isn’t a particularly volatile game though but can pay over 1,700 times your bet on every spin. The low variance will put some players off. If you don’t mind that then Wild Scarabs is a decent all-rounder. The design is top class and there are a couple of enjoyable extras. It’s not our favourite Egyptian-themed game but this journey to the desert is enjoyable enough if you’re a fan of the theme. For an excellent trip to ancient Egypt, Leprechaun Goes Egypt by Play ‘N Go is a superb option.